When my MIL visited last weekend she found a Fine Cooking Grilling magazine from 2008 with so many great recipes we wanted to try them all! Instead we opted for 3 and one was better than the next! 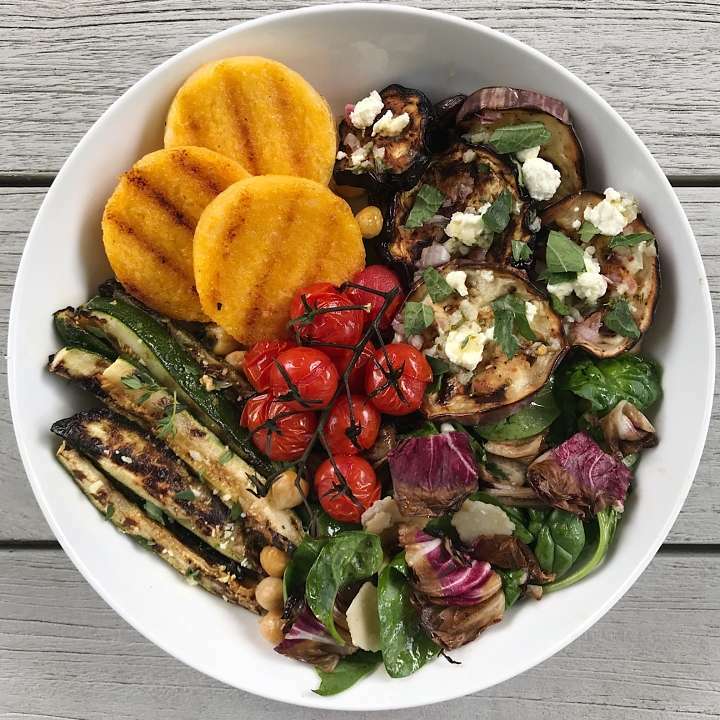 GRILLED ZUCCHINI with Lemon Balsamic Vinaigrette, GRILLED EGGPLANT with Garlic Cumin Vinaigrette, Feta & Herbs, and Spinach & GRILLED RADICCHIO Salad. Each dish was light, fresh tasting and dreamy in its flavor combination really highlight the vegetable. The Grilled Zucchini was crisp tender and so fresh tasting and melt in your mouth yummy with the lemony balsamic vinaigrette. The Grilled Eggplant was divine with the mix of flavors. The eggplant was topped with lemony shallots, feta, fresh mint and cilantro and drizzled with a garlicky cumin vinaigrette. The combination was light but so flavorful! The Spinach Radicchio Salad was simple but so delicious. The peppery, slightly bitter radicchio paired beautifully with the baby spinach, shaved parmigiano reggiano and a simple oil oil- balsamic vinaigrette. We served these alongside grilled polenta, roasted tomatoes and grilled chicken, and this was my plate.